FS4BD | Tappan Tech1 up to 14 SEER Air Conditioner Scroll compressor for quieter operation—fewer working parts than reciprocating piston compressors, longer service life and reliability Heavy duty motor—provides maximum high-speed efficiency for improved air flow capacity long-lasting durability and quiet operation. It is completely protected from rain and snow, and requires no maintenance A Tappan Tough TM jacket—full-metal, louvered jacket protects coil from impact of flying debris due to mowing, golf balls, hail and other hazards B Tappan Tough TM construction—galvanized steel for added strength and durability, featuring silicone protected 1.5 mil polyurethane finish that provides superior corrosion resistance, 50% better protection than standard outdoor finishes One-piece top with integrated fan orifice designed for maximum air flow and minimum noise All-aluminum Micro-Channel coils for increased corrosion resistance• When a 13 SEER outdoor section is installed with an indoor section (furnace and coil) featuring a variable-speed blower motor, you can increase the efficiency levels up to 14 SEER,To learn how you can get the most comfort–and biggest return in energy savings from a totally integrated indoor comfort system, talk to your Tappan contractor. From thermostats, to air cleaners, matched coils for new condensing units, humidity and zone control systems, and other indoor air quality accessories, you’re sure to get tough, dependable technology that’s built to last. All of which makes you one very smart customer. Tough. Smart. Tappan. TM • Designed using galvanized steel: with a polyester urethane coat finish.The 950 hour salt spray finish resists corrosion 50% better than comparable units. • Permanently Lubricated Motor :A heavy duty PSC motor for long lasting reliability and quiet operation. Requires no maintenance and is completely protected from rain and snow. • Louvered Condenser Guard: Durable metal guard protects the coil from yard hazards and extreme weather. • Removable Top Grille Assembly: Allows ease of service from the top without disconnecting fan motor leads. • High Pressure Switch: Protects against abnormally high system pressures. Auto-reset feature prevents nuisance service visits. • Liquid Line Filter Drier: Included with unit, field installed. • One Piece Top/Orifice: Designed for maximum airflow and quiet operation. • Easy Compressor and Control Access: Designed to make servicing easier for the contractor, access panels are provided to all controls and the compressor from the side of the unit. • Composite Base Pan: Absorbs sound and is corrosion resistant. Composite is also stronger and lighter than steel. • Swept Wing Fan Blade :Designed to significantly reduce unwanted noise. • Micro-Channel Coils: All aluminum coils in all models which provides high corrosion resistance. ,Available in Certain Regions: Now, minimum efficiency standards for split-system air conditioners varies according to climate. Because of this, this model is now only available in northern climates. To find out if it is available in your area, talk to your local HVAC specialist.Crafted with Galvanized Steel: The cabinet of this exceptional air conditioner is constructed using galvanized steel coated in a corrosion-resistant, polyester-urethane finish.Smooth System Performance: This air conditioner model includes a swept-wing fan blade to reduce unwanted noises associated with operation.Efficiency Gain: To achieve maximum system performance and efficiency, pair this air conditioner with an indoor component that includes an energy-efficient motor.Micro-Channel Coil Included: The unit includes an all-aluminum Micro-Channel coil for increased durability through corrosion resistance. Best Quality Possible: At Tappan, we check our units multiple times at the factory to make sure they meet our high quality standards. This unit is checked 144 times before being shipped. For reliable central cooling performance, turn to the FS4BD air conditioner. This up to 14-SEER air conditioning model can deliver exceptional home comfort levels while the initial price tag can be more budget friendly. 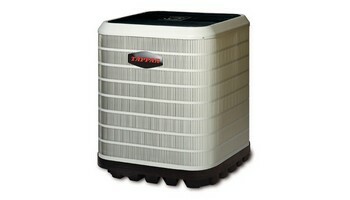 Ask your contractor if this is the right Tappan air conditioner for your home.